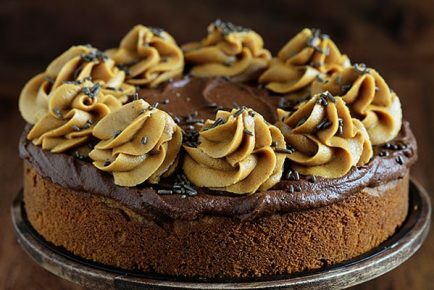 Creating an Easter Egg Surprise-Inside® Cake is easier than ever! Try my special technique for a detailed and fun INSIDE design! 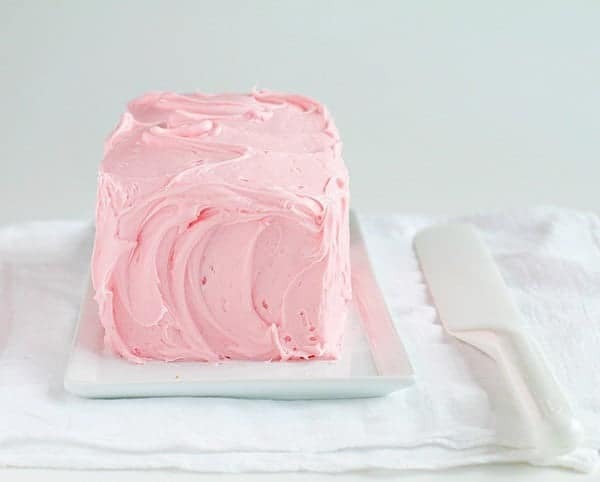 Prepare one of the white cake mixes by following directions on box and adding strawberry extract. Divide cake batter evenly into five bowls. Stir 1/2 teaspoon of food color to each bowl. Add neon pink to one bowl, orange to the next (1/4 teaspoon yellow, 1/4 teaspoon red), yellow to the next, green to the next, and blue to the last bowl. Place a medium resealable plastic bag in a tall drinking glass and let the edges of the bag drape around the outside edge of the glass. 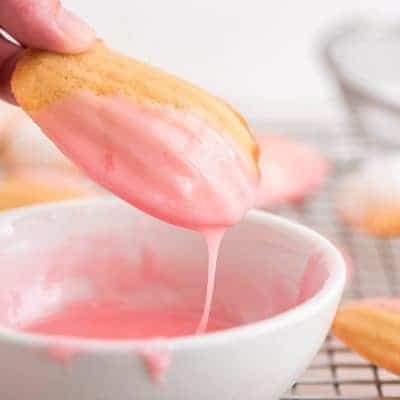 Pour the pink batter into the bag. Remove bag from glass, twist bag around, then secure bag with a twist-tie or rubber band. Set aside. Continue with remaining four colors. 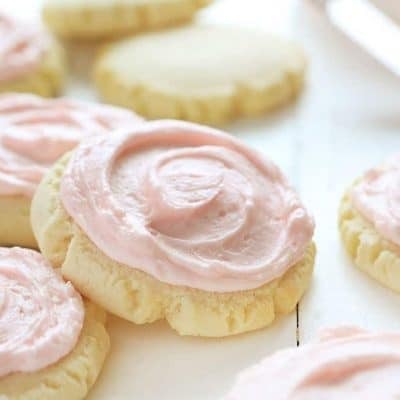 Place a piece of parchment paper on a cookie sheet. Cut off a 1/4-inch piece from the tip of one of the corners of the pink bag. Pipe a 1/4-inch thick line of batter lengthwise on the parchment paper. Continue with all the colors until the parchment paper is completely covered in stripes of batter. Lines of batter should be touching each other. 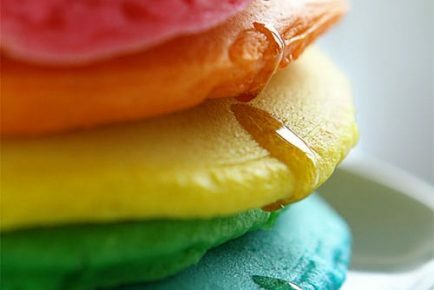 (Place the bags of batter in separate glasses to keep them upright while piping out each color.) Use a second cookie sheet if necessary so that all of the cake batter is used. Bake in preheated 350°F oven 8 to 10 minutes or until edges of cake start to brown. Cool completely on wire rack. 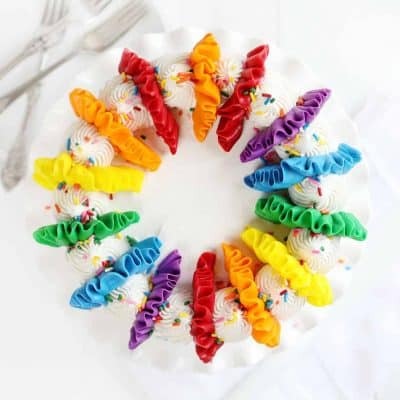 Using an egg-shaped cookie cutter (approximately 2 1/2 inches across and 3 inches high), cut out egg shapes from the striped cake. Prepare remaining white cake mix following the directions on the box. Pour about 1 cup of batter into 9×5 loaf pan sprayed with no stick cooking spray. 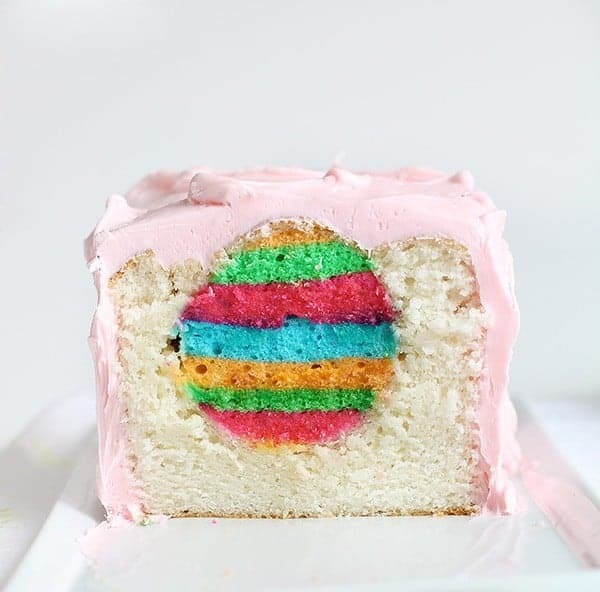 Place the striped cake eggs standing up along the center of the loaf pan so that the entire center of the pan is filled with a line of cake eggs. (Cake eggs should be touching. 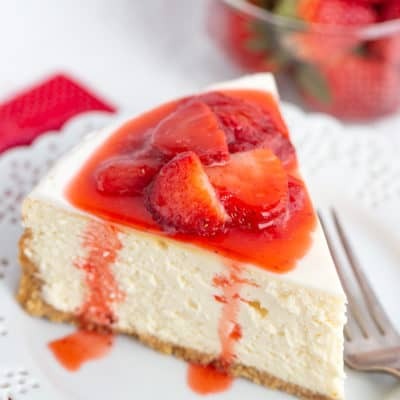 Do not leave any spaces between them or the white batter will seep in between.) Carefully pour remaining white batter over the cake eggs, filling in the sides first and then pouring over the top. Here is a quick video to show how I did the surprise-inside! 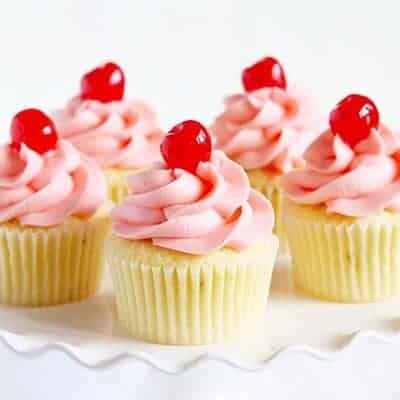 Bake in preheated 350°F oven 40 to 45 minutes or until a toothpick inserted into the white cake comes out clean. Cool in pan 10 minutes. Remove from pan; cool completely on wire rack. 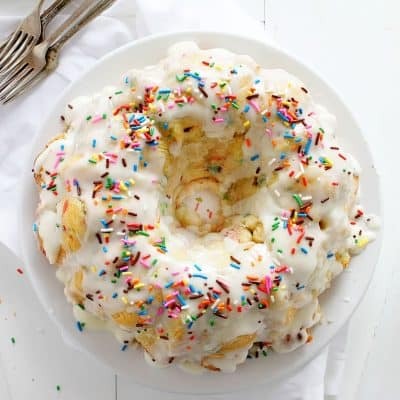 For the buttercream, beat butter and vanilla in large bowl until light and fluffy. Gradually add confectioners’ sugar, beating well after each addition and scraping sides and bottom of bowl frequently. Add milk; beat until light and fluffy. Stir in red food color. 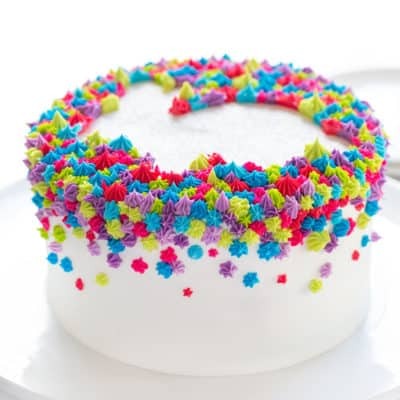 Frost top and sides of cake with Buttercream. 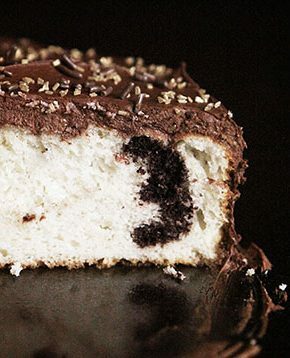 For ease in cutting out egg shapes, freeze the cookie sheet with the striped cake for about 1 hour. Press cake eggs gently into white batter. 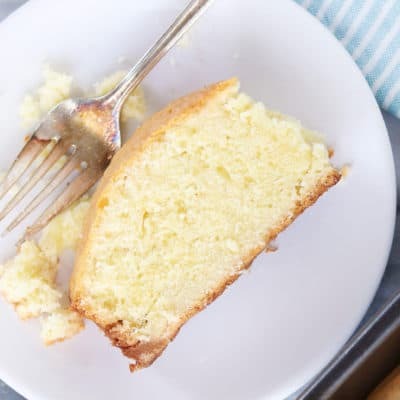 Use less white batter under the cake eggs so that they do not float up within the cake. 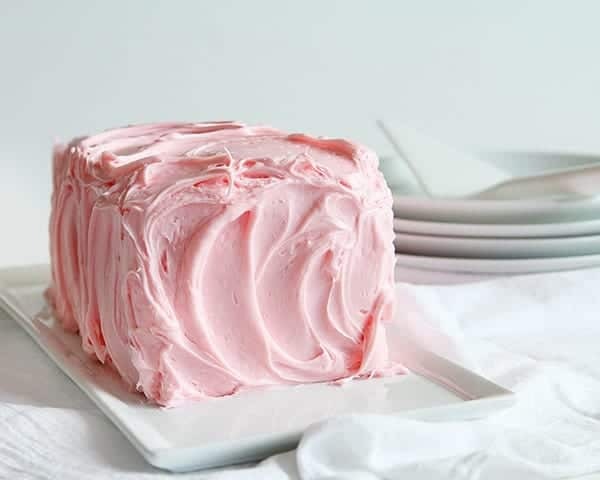 For Fruit-Flavored Buttercream, add 1 teaspoon McCormick® Imitation Strawberry Extract or McCormick® Raspberry Extract or 1/2 teaspoon McCormick® Pure Lemon Extract or McCormick® Pure Orange Extract. 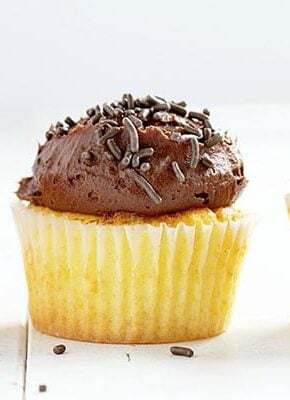 If desired, tint lemon frosting with yellow food color or orange frosting with yellow and red food colors. 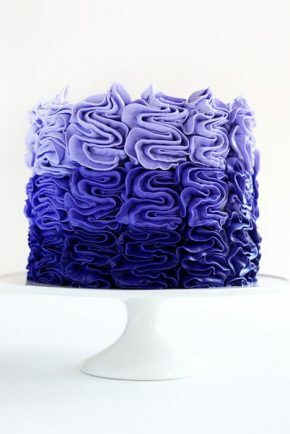 Chill cake until ready to serve! 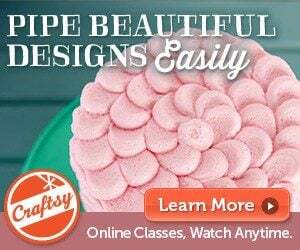 Made this cake today and it turned out perfectly thanks to the great step by step and video tutorial. So pretty and festive. My family will love cutting in to this on Easter Sunday and finding the Easter egg inside! Thank you!!!! How do you keep the eggs from floating up in the remaining batter before baking? 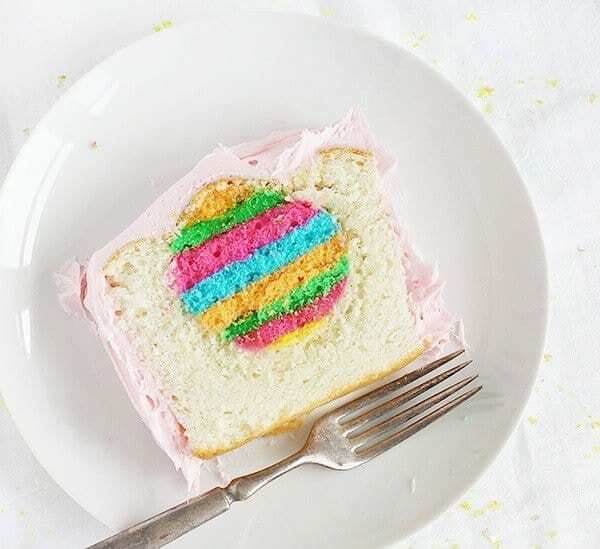 One Cake mix is used for the cake, and one cake mix is used for the rainbow stripes. Hope that helps I think it would make a wonderful Easter dessert. 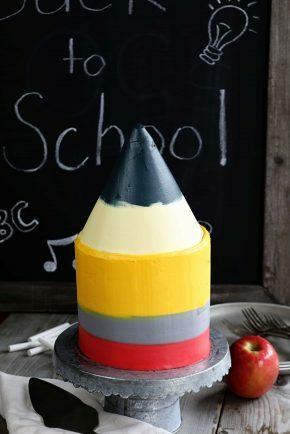 Just to be clear – Are you using what would make 1 layer for the eggs and the other layer for the rest (white part) of the Cake? This easter cake looks so yummy can’t wait to have it.